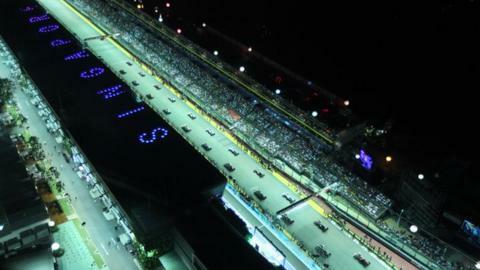 The Singapore Grand Prix is a favourite among Formula 1 drivers. It is one of the most challenging tracks in the world championship, with a lot of unique characteristics. Having a street circuit in the middle of a city such as Singapore creates an incredible atmosphere. It is one of the most visited cities in the world, it is very cosmopolitan and, most of all, the race is at night - the only grand prix at that time. All in all, it is a great track to drive around and a really fun weekend. Every driver enjoys a street circuit and the unusual circumstances of Singapore make it even more exciting. We work during the night and sleep during the day, which sounds weird but actually works really well. It is a perfect scenario. The layout does not look much on a track map, but actually it is very technical and hugely physical for the driver. And it is probably the toughest race on the calendar for a number of reasons. It is very warm in Singapore, often 30C even at night, it's very humid being in the tropics and it feels as if there is not really any air. On top of all that, it is the longest race of the year - nearly two hours - and was won in 2011 by Red Bull's Sebastian Vettel. The walls are close and you see all the skyscrapers as you go around the track; it is just a beautiful experience. To get the best out of the track you have to ride all the kerbs at the corners, nearly all of which are quite slow, so traction and braking stability are crucial. The car is loaded with downforce, because the straights are not that long, and there are places to overtake. The corners are all quite slow and are quite different from what you might experience at other tracks. There are a lot of slow-speed corners and hairpins, with big braking, but some of them are quite special. Take Turn 11 as an example. It has big kerbs at a chicane, which we take in second gear. There is no corner like it anywhere else in the world. It is fantastic because you can really jump over the kerbs, which means the car has to be set up with quite soft suspension. In some ways, it is like a rally course, with so many slow-speed corners and so many places to lose and gain time. It is a fantastic feeling. McLaren's Lewis Hamilton heads into this weekend's race in Singapore looking to further close the gap on championship leader Fernando Alonso following his Italian Grand Prix victory at Monza earlier this month. My work as Pirelli's test driver continued last week: we did a two-day test in Barcelona analysing some tyre developments. It was a very important test for us because this week we will be choosing the tyre specifications for 2013 and we got through an awful lot of work - I completed 900km on each day. We found some different compounds and constructions. I'm not allowed to say too much about them, but it was interesting to test so many different types of tyre because we discovered some interesting things. It was all very positive - and a great experience for me because we did lots of laps on both days. Now I am looking forward to the test we are doing on wet tyres in Paul Ricard in the south of France in two weeks' time.